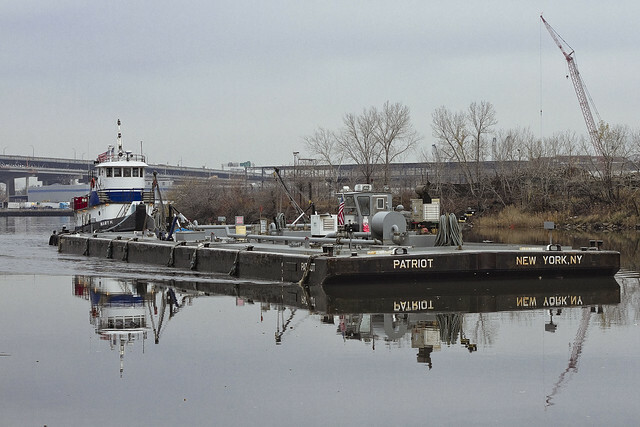 Banal pedantry, Newtown Creek, and the Feds – in today’s post. Last week, one found himself out in the rain with the EPA Superfund team. We were trying to help them site a series of warning signs, which will be installed at the handful of Newtown Creek “public access” spots which are hidden along the bulkheads and visited by anglers or lookie loos (that includes you kids from Apollo Street), signage whose missive would advise against the catching of or consumption of the fish who populate the lugubrious and heavily polluted depths of the Newtown Creek. “EEPAH,” indeed. The EPA team requested counsel on the placement of their signage from the Newtown Creek Alliance Project Manager – Will Elkins – who asked me to come along as well. We accompanied”EEPAH” on a somewhat grand tour of the Newtown Creek, hitting a bunch of spots where either Will or myself had seen people fishing over the years. The Feds figured out where they place their signage, marked stuff down, and generally did “EEPAH” stuff. I did my thing too. 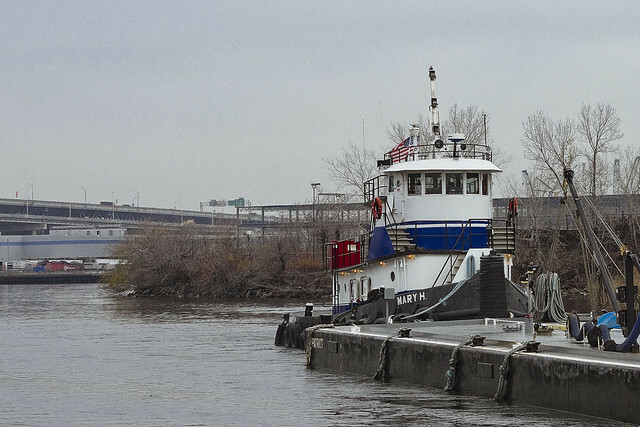 Whilst at the Brooklyn side Maspeth Avenue street end, the tug Mary H. was spotted. Mary H. services the Bayside brand oil tanks you’ll notice adjoins the Metropolitan Avenue Bridge, barging in bulk product which is then distributed to their end customers via heavy truck. The amazing part of this – and it is somewhat amazing – is that the Bayside distribution facility is about 3.1 miles back from the East River, at the border of industrial Maspeth and Bushwick East Williamsburg. Tugboats, barging cargo three entire miles into Brooklyn – it boggles. Metropolitan Avenue was formerly known as the Williamsburgh and Jamaica Turnpike, and it connected Newtown in Queens with the Eastern District of Brooklyn – Bushwick, Williamsburg, and Greenpoint. The crossing of Grand and Metropolitan was also one of the stops on the New York and Manhattan Beach Railroad, its depot would have found at the foot of Greenpoint’s Quay Street in 1912. The Brooklyn side of Maspeth Avenue follows the northern path of the Maspeth Toll Bridge Co.’s Plank Road, and I was standing on what was once known as Furman’s Island while I was shooting the Mary H. tug. The Plank Road bridge last crossed the Newtown Creek in 1875, during the Presidential Administration of Ulysses S. Grant. Connecting the colonial communities of Maspeth and Newtown via the hellish expanse of Furmans Island (home to Peter Cooper’s Glue Factory, Conrad Wissel’s Night Soil and Offal Dock, and Kalbfleisch and sons, amongst other notorious or malodorous occupants), the Plank Road today exists as a destination for Newtown Creek devotees and fetishists. Also, the Feds. 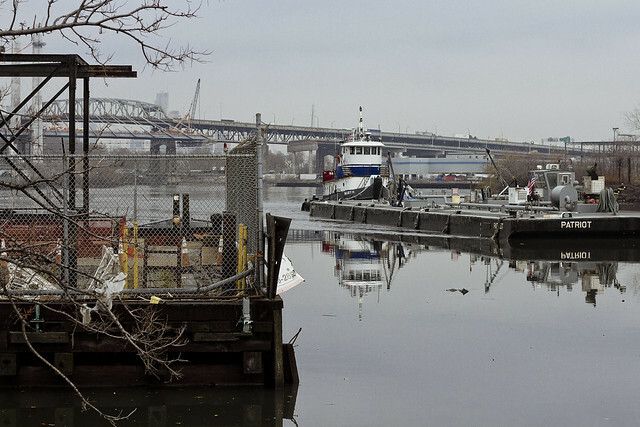 On the Queens or Maspeth side, Newtown Creek Alliance has a major shoreline rehabilitation project underway, which is being run by the aforementioned Will Elkins. There’ll be a “Don’t eat the fish” sign there too.